Home » Mangyshlak of peninsula unique natural places of interest. Tours to Boszhira valley. Central Asia and Mangyshlak tours. On September, 25th, 2015 I have visited second time cavity Utebai after April, 2012. It would be desirable to notice, that the southwest part of a cave has gone deep up to 70 meters. By an inclined part of a cave the stone river flows down. Cavity Utebai, settles down in a southern part of a plateau Ustyurt, approximately in 55 kilometers from natural boundary Onere of the reserve Ustyurt located in territory. 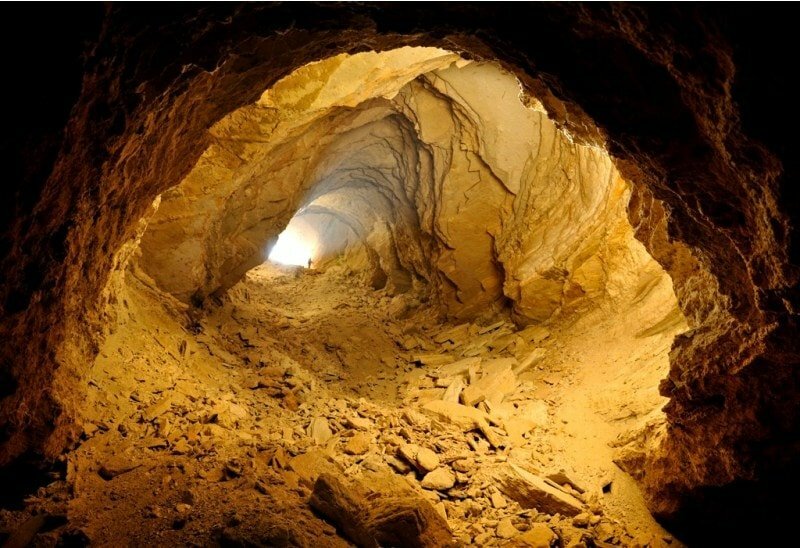 There Is a cavity in 10,5 kilometers from cave Balayk. The cave sloped type, landslide. The body cuts through the limestone of the bluff. Of course, the more it resembles a failure. Cavity Utebay represented by two steeply inclined gallery moves from the bottom of failure, the very large and spacious. South-Western course is a tunnel with dimensions of 3.5 x 14.6 m and ends with a stalemate after 22.5 meters. In the right wall of the stub has a gap of 0.4 x 3 meters, beyond which is seen the continuation of the operation. The North-Eastern approach represents a steeply inclined tunnel with a distan, by which it descends to a depth of 56 meters, then the course flattens out and becomes flat with a distance of 6° and 40 meters is a dead end. ce of 45°. In the lower part of the North-East wall there is an open slit-like ponor 1.3 m x 0.53 m. The ceiling of progress in landslide everywhere, stepped, arched stroke, with a ceiling height of from 3 to 12 meters. Cavity Utebay dry, except, perhaps, a short winter period when rainfall flows are entered in loose soil material, forming a temporary bottom of the lake. A temporary lake, probably appears here, but for a very brief period, then seeps through cracks deep. This means that the cavity has not reached the impermeable layer and possibly its sequel. Air infiltration were not observed and the temperature of the air in the cavity in the observed period was equal to 18° C.
In the case of oblique entrance of the cave is a large cave, which gradually, during the descent, narrows. Since the bottom of the cave, the walls and ceiling are made of white karstic deposits and given the high light of the grotto at the entrance, the cave is well-lit in the sun tens of meters, when the sun is in the southwest position. Alexander Shakalov. http://speleokz.ucoz.ru, Alexander Petrov.